February 28, 2018, Morrisville, PA—Morrisville Borough announced today that the long-anticipated demolition of the former M.R. 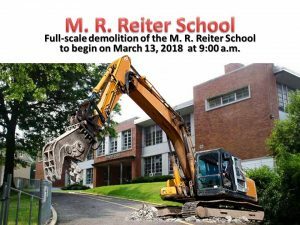 Reiter School will begin on March 13, 2018 at 9:00 a.m. sharp, rain or shine. Local officials will be on-hand one last time to say goodbye to the school. Under a contract with Morrisville Borough, Premium Excavating will be demolishing the school building located at Harper Avenue and Hillcrest Avenue. The project has been coordinated by the Bucks County Redevelopment Authority as part of an effort to eliminate blight. Funding for the project came from a variety of grant sources including the Bucks County Commissioners and the Commonwealth of Pennsylvania. The former school property, which neighbors the historic Summerseat Mansion, will become a community park and will remain passive open space.